The growing global demand for energy, combined with a need to reduce emissions and lessen the effects of climate change, has increased focus on cleaner energy sources. But what unintended consequences could these cleaner sources have on the changing climate? Researchers at MIT now have some answers to that question, using biofuels as a test case. 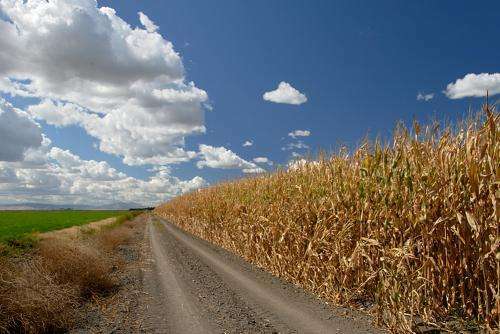 Their study, recently released in Geophysical Research Letters, found that land-use changes caused by a major ramp-up in biofuel crops—enough to meet about 10 percent of the world's energy needs—could make some regions even warmer. "Because all actions have consequences, it's important to consider that even well-intentioned actions can have unintended negative consequences," says Willow Hallgren, the lead author of the study and a research associate at MIT's Joint Program on the Science and Policy of Global Change. "It's easy to look at a new, cleaner energy source, see how it will directly improve the climate, and stop there without ever considering all the ramifications. But when attempting to mitigate climate change, there's more to consider than simply substituting out fossil fuels for a cleaner source of energy." Hallgren and her colleagues explored some of those consequences in considering two scenarios: one where more forests are cleared to grow biofuel crops, and one where forests are maintained and cropland productivity is intensified through the use of fertilizers and irrigation. In both cases, the researchers found that at a global scale, greenhouse-gas emissions increase—in the form of more carbon dioxide when CO2-absorbing forests are cut, and in the form of more nitrous oxide from fertilizers when land use is intensified. But this global warming is counterbalanced when the additional cropland reflects more sunlight, causing some cooling. Additionally, an increase in biofuels would replace some fossil fuel-based energy sources, further countering the warming. While the effects of large-scale expansion of biofuels seem to cancel each other out globally, the study does point to significant regional impacts—in some cases, far from where the biofuel crops are grown. In the tropics, for example, clearing of rainforests would likely dry the climate and cause warming, with the Amazon Basin and central Africa potentially warming by 1.5 degrees Celsius. This tropical warming is made worse with more deforestation, which also causes a release of carbon dioxide, further contributing to the warming of the planet. Meanwhile, Arctic regions might generally experience cooling caused by an increase in reflectivity from deforestation. "Emphasizing changes not only globally, but also regionally, is vitally important when considering the impacts of future energy sources," Hallgren says. "We've found the greatest impacts occur at a regional level." From these results, the researchers found that land-use policies that permit more extensive deforestation would have a larger impact on regional emissions and temperatures. Policies that protect forests would likely provide more tolerable future environmental conditions, especially in the tropics. David McGuire, a professor of ecology at the University of Alaska at Fairbanks, says these findings are important for those trying to implement mitigation policies. "Hallgren et al. caution that society needs to further consider how biofuels policies influence ecosystem services to society, as understanding the full dimension of these effects should be taken into consideration before deciding on policies that lead to the implementation of biofuels programs," McGuire says. He adds that he finds Hallgren's incorporation of reflectivity and energy feedbacks unique among studies on the climate impacts of biofuels. While Hallgren focuses specifically on the climate implications of expanded use of biofuels, she admits there are many other possible consequences—such as impacts on food supplies and prices. A group of her colleagues explored the economic side of biofuel expansion as part of a study released last year in Environmental Science & Technology—a paper that was recognized as that journal's Best Policy Analysis Paper of 2012. The team, led by Joint Program on Global Change co-director John Reilly, modeled feedbacks among the atmosphere, ecosystems and the global economy. They found that the combination of a carbon tax, incentives for reforestation and the addition of biofuels could nearly stabilize the climate by the end of the century; increased biofuels production alone could cut fossil-fuel use in half by 2100. But just as Hallgren found trade-offs when she dug deeper, so did Reilly and his team of researchers. "The environmental change avoided by reducing greenhouse-gas emissions is substantial and actually means less land used for crops," Reilly says. This leads to substantial rises in food and forestry prices, he says, with food prices possibly rising by more than 80 percent. Hallgren says, "There is clearly no one simple cause and effect when it comes to our climate. The impacts we see—both to the environment and the economy—from adding a large supply of biofuels to our energy system illustrate why it is so important to consider all factors so that we'll know what we're heading into before making a change." This is the quality that MIT is putting out... I'm glad I went to Worcester Polytech. When do you begin with this article, how about with we're not going to rip up forests so we can make biofuels.